This is the first album by the crazy Finns where they are only playing songs written by themselves. So far they have covered songs by such different artists like Aqua, Garbage, Van Halen, Judas Priest,... My first thought was that this album may be boring because the fun of guessing which song was covered didn't exist anymore. But after having listened to the first two songs Humppaelämää and Katkolla Humppa, you are already in the right party mood. Eläkeläiset haven't changed anything from the musical point of view. They are still playing a kind of music where polka gets combined with rock without guitars. All four musicians are singing and they are playing bass guitar, accordion, a casio keyboard and a mini drumkit. 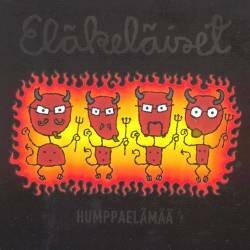 It's impossible to say which is the best song on this CD, but Eläkeläiset (which is the Finnish word for 'retired people') show that they are able to play great own songs. Maybe now other bands will start covering Eläkeläiset... The only not so funny fact about this CD is that it is containing 32 minutes of nothing at the end.